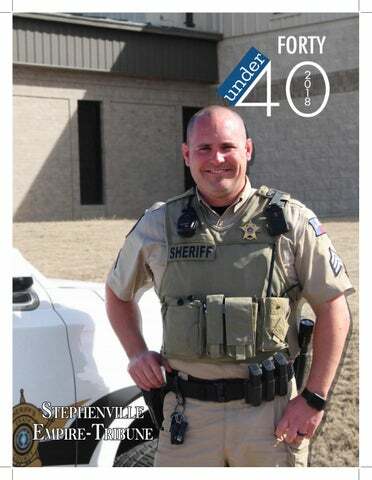 e are proud to present our second annual 40 under 40 magazine, brought to you by the Stephenville Empire-Tribune. This project is truly a labor of love, one that was months in the making. It started with input from our community, and this year we received over 80 nominations. From there our editorial team narrowed the list to 40 finalists. On the following pages you will meet those 40 individuals — from young doctors and professionals to those working in education and law enforcement. What they have in common is a deep commitment to their community. Each of them is younger than 40 years old and in the time of their lives when they are juggling careers, busy families and community activism. They are the people working to make Erath County a wonderful place to live, work and raise a family. We hope you enjoy 40 under 40 as much as we enjoyed putting it together. Congratulations to those who were selected this year, and on behalf of this community, we appreciate all that you do. About us 40 under 40 is a special publication produced by the Stephenville Empire-Tribune. The E-T is located at 702 E. South Loop, Stephenville, TX, 76401. We can be reached at 254-965-3124. 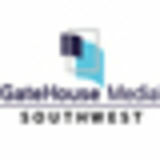 Find us on our website at yourstephenvilletx.com.   # ! Dr. Lauren Adams is the owner of Cornerstone Animal Hospital in Stephenville. other people if I can — and of course the animals, that’s a given,” she said. After Hurricane Harvey, Lauren and her staff took in 29 dogs that had lost their homes and owners and in partnership with P.A.W.S. was able to reunite two with their owners and adopt out almost all of the others. “I’ve always wanted to do something with disaster relief,” she said. “So the Harvey dogs, being able to foster them, was a little bit of a dream come true in being able to help and do my part.” Lauren and her fiancee Austin Reese have one little boy, Gabe, who’s a little over one year, and of course pets of her own — three dogs, two cats and a couple of horses. He’s also a member of the Stephenville Evening Lions Club and involved in Leadership Stephenville and the Stephenville Economic Development Corporation. ERATH COUNTY SHERIFF’S OFFICE IS PROUD TO HAVE SGT. KENT HOWELL ON OUR TEAM! Vanessa Griffin is the Erath County jail administrator, a mom and coach. interesting because in the jail, it’s just you and them and you either have the mentality for the job or you don’t,” she said. “I really like being here.” Vanessa hopes to go back to college and earn a degree in forensics. “I’ve always been interested in law enforcement and helping in some way,” she said. Dr. Joanna Shaw teaches in the College of Business at Tarleton State University and loves her students, family and community. The family attends First Baptist Church Stephenville. Josh has a real estate license, is president of the Farm Bureau board, and is the one of the directors of the Cross Timbers Soil and Water Conservation board. grown into one of the largest equine dealers in the nation for ADM Animal Nutrition.” Chris has been the Dublin Chamber president the past three years and says he will step down at the end of 2018. “Being on the chamber has been exciting,” he said. “It’s great to be able to be on the business side with Bradberry’s but also come in and help with organizations.” After stepping down from the chamber, Chris said he’s sure he will get involved somewhere else. randon Huckabee is the kind of guy moms around the world hope their daughters will one day marry. He’s nice, easygoing, hardworking and funny. But best of all he loves his family and the community where he grew up. Brandon graduated from Stephenville High School in 1999, then traveled to various cities in Texas working in retail management. When he and his wife Alyssa had their daughter Brinley, now 3, the couple decided it was time to head home. “In 2014 I started to look into businesses I could start in Stephenville so we could move back,” he said. “I’ve always liked the entertainment business and when I was a kid, my sister and I would host radio shows at our grandparent’s house. Our grandparents would be our guests and my grandpa would play his harmonica,” she said. “And during the holidays we would put on variety shows.” While attending Missouri State, Audie attended a few concerts and met a program director for a local radio station. “He offered me a job as an overnight program Audie Renee hosts a assistant and three months morning radio show on later he gave me my own KSTV. weekend show,” she said. Audie was hooked. Today, she is involved in the Stephenville Optimist Club and sings in the choir at First Baptist Church. “I love the fact that the community is so tight-knit,” she said. moved to Stephenville in December 2016 from Dallas. “My favorite part of my job is the interaction I have with the listeners,” she said. She started prepping for her future at a young age. being out on the water paddle boarding or sailing, or fishing — things like that,” he said. Aly Caulder is corporate chef and director of catering for Hard Eight BBQ and The N at Hardway Ranch. events that take place here,” Aly said. “And that’s one of the things I love most about my job.” Aly and her husband Aaron own Stephenville Pipe and Trade. “He runs the business and I help with the books,” she said. The couple has a two-year-old daughter they plan to raise in Erath County. “I love it here. I love the feel of a small town and the kindness of the people,” she said. “You just don’t find that in many other places. and my wife and kids – that takes up just about all my time,” he said with a laugh. “Although we do fantasy football here at work and I did a fantasy football thing this year with my son, who plays flag football. It was a father-son fantasy football league, and that was a lot of fun.” Aaron is also involved in his church, the Graham Street Church of Christ. Craig Parks is the technology director at Dublin ISD. ing things work,” he said. “And I like making sure the kids have the tools they need to access technology.” Outside of Dublin ISD, Craig also works as an IT consultant for Parks Hill Technology and Marketing. He and his wife Amber are members of the Cross Timbers Fine Arts Council and danced in last year’s Dancing For the Stars event benefiting Big Brothers Big Sisters of Erath County. “If there is any kind of fundraiser going on, we are there,” Craig said. medicine. “But I do see a lot of women in my practice. I work with men as well, but I think a lot of women feel a little more comfortable working with a female physician with certain things. “Women’s medicine is something I feel passionate and strongly about. A lot of women come in and say they’re so happy to have a woman practicing here, so that’s very gratifying.” The family attends First United Methodist Church. “I really love cooking and homemaker kinds of things, taking care of my family is a great joy for me,” Miranda said. Nicole Young at her desk at Citizens National Bank where she works as the assistant branch manager. they welcomed their darling baby Layla into the world. Kenny was the manager of Dublin Bottling Works for over a decade and he also held a seat on the Economic Development Corporation board of Dublin. Lacey says, “I’m also a private voice and piano instructor and have worked as a freelance writer and social media manager.” Missionaries for Child Hope are responsible for raising the funds for the kids they’ll be working with. “We visited over 60 churches and civic organizations all over Texas,” Kenny says. The Hortons ultimately raised enough to sponsor 55 kids in this ministry.